By reading the article “Serving Top Comments in Professional Social Networks” on the LinkedIn engineering blog I stumbled upon the signals that the LinkedIn machine-learning model looks at to rank top comments on the platform. While this seems to be limited to comments – I argue – those signals can teach us how LinkedIn‘s team think about the relevance of content. Thus, in a way, it makes you better at communicating on LinkedIn. In short, my argument is this: if the LinkedIn team decided to use the following signals for its machine-learning model to rank top comments, those signals might actually be relevant also for other kinds of contents on the platform. However, I want to repeat – here I must use the conditional – those “might” be the signals LinkedIn algorithms look at in general when ranking content. We have commenter features that characterize each commenter’s reputation and popularity (i.e., their profile view counts, influencer status, etc.). We also match the commenter and the viewers on the basis of industry, location, and other shared attributes. At LinkedIn, we have access to various mature machine-learned signals to represent the engagement affinity between two members. We take into account their connection/follow relationships, their profile similarity, and past interactions on the feed. These signals are crucial inputs that help us select high quality comments that are personalized to each viewer. As far as the actual comment content is concerned, we leverage our in-house Natural Language Processing (NLP) library to characterize the language, the comment length, the grammatical structure, the presence/absence of hashtags, and other content features. We also attempt to infer whether the comment includes mentions of LinkedIn members or other entities. Social engagement features generated on the feed are segmented by industries for the machine learning model to capture when a particular comment might only be popular for a segment of members. Comment freshness features capture recent actions on the comment. We capture the timestamp of comment creation, the last reply, and the last like. Viewers have a tendency to read fresh comments or recently discussed topics. We’ve only scratched the surface here. There are close to 100 features that we capture and use in online ranking. Those features might turn into thousands of signals. In fact, as soon as you access to your LinkedIn feed, a machine learning algorithm identifies in a fraction of a second the posts that are most relevant to you. This means the algorithm has to be able to rank tens of thousands of posts in that fraction of a second. Identity: Who are you? Where do you work? What are your skills? Who are you connected with? Content: How many times was the update viewed? How many times was it “liked”? What is the update about? How old is it? What language is it written in? What companies, people, or topics are mentioned in the update? Behavior: What have you liked and shared in the past? Who do you interact with most frequently? Where do you spend the most time in your news feed? Thus, based on three major/broad categories, related to your identity (company, skills, connections), content (likes, comments, share for that update), and behavior (for instance, who you interact with more frequently) that is how LinkedIn builds your feed. These range from well-known metrics, like time spent reading, to insights from your social graph. We also incorporate a variety of findings from other sources in our models, such as user experience research. Creator-side optimization: Many recommendation systems focus on optimizing for discreet, short-term gains in member activities (click, like, share) as a proxy for member engagement and value. In the future, we’re investing in models that specifically optimize for members who create high-quality content on LinkedIn over time. If high-quality content remains the long-term focus of LinkedIn, then you can expect a high ROI from investing time and resources on this platform. In this article, we’ve looked at some of the signals used by LinkedIn machine-learning model to rank top comments. 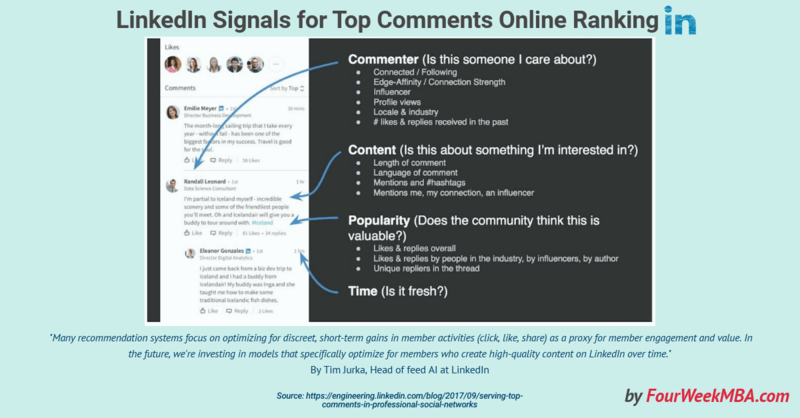 If those signals are applied to classify top comments they might also be used to rank online content on LinkedIn – I argue. Of course, as LinkedIn AI-powered algorithm built on top of a vast knowledge graph, becomes smarter the more signals it might take into account. In fact, as pointed out by the LinkedIn engineering team, as of now there are thousands of signals taken into account to personalize the feed and a hundred features used for online ranking. Looking at the signals, LinkedIn engineering team takes into account for ranking top comments also help you understand the aim of the platform, thus making you more effective at communicating on LinkedIn. Some of the interesting aspects and questions to ask when posting on LinkedIn are related to content quality. In fact, as LinkedIn will invest more resources at looking for quality of content rather than traditional signals used on social media (likes and shares), it becomes critical to assess whether you are publishing quality content. How can that be defined according to what we’ve seen in this article? Is this something useful for my audience? Am I mentioning relevant people to whom I have built a trusted relationship over time? Does my community find it valuable?